The Celestial Ceiling project was developed in partnership with Charles Burnett of Duff House, Banff, the Schleiffer family of Cullen House, On the Edge Research and the artists John McGeoch and Robert Orchardson. Duff House, an Adams building, is part of the National Galleries of Scotland. The challenge posed by the research partner was how to change the image of the house from being simply a collection of national treasures to a more responsive cultural and historical resource. The project moved from the general issue of visitor numbers to a unique creative opportunity, stemming ironically from the tragic loss of an important piece of heritage in the locale. Charles’ knowledge and expertise in Scottish history connected the researchers with the Schlieffer family, owners of the south tower in Cullen House, which in 1987 had been destroyed by fire – including a unique 16th century tempera painted ceiling. The tower had been restored but the painting on the wooden ceiling was lost forever. The Schleiffer family wanted to contribute to the continuing heritage of the building by commissioning new art. The project grew in ambition and scale and two artists were commissioned to respond to the challenge. John McGeoch works with digital technology. Through a collaborative process of researching and identifying visual fragments in various archives the material for a complete digital reconstruction of the original ceiling was sourced. John produced a large scale interactive projection on public display for the first time in Duff House. The technology enabled immersive engagement with the painting, and a capacity for zooming into details which no-one in recent history had ever seen. 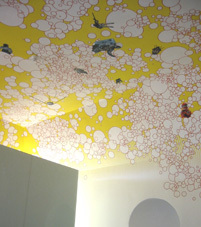 The second commission offered Robert Orchardson an opportunity to make a 21st century response to the original ceiling. His new painted ceiling in the space of the original encapsulates the values of the patrons – optimism, risk-taking, forward thinking. Robert’s painting offers a visionary contemporary counterpoint to the original yet draws on its ‘celestial’ language. 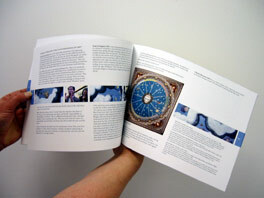 The two art works are thought provoking in different ways but the Celestial Ceiling publication clearly presents the On the Edge research methodology as a radical departure from traditional ways of commissioning new art. Workshops, two ‘gatherings’ and various evaluation ‘soundings’ developed the project in a reflective and generative way. The conversations at the gatherings present the shared thinking from a range of perspectives – history, heritage, art criticism, curation, art practice. Celestial Ceiling provokes new thinking on the relationship between contemporary art, built heritage and patronage through the interaction of public and private realms.